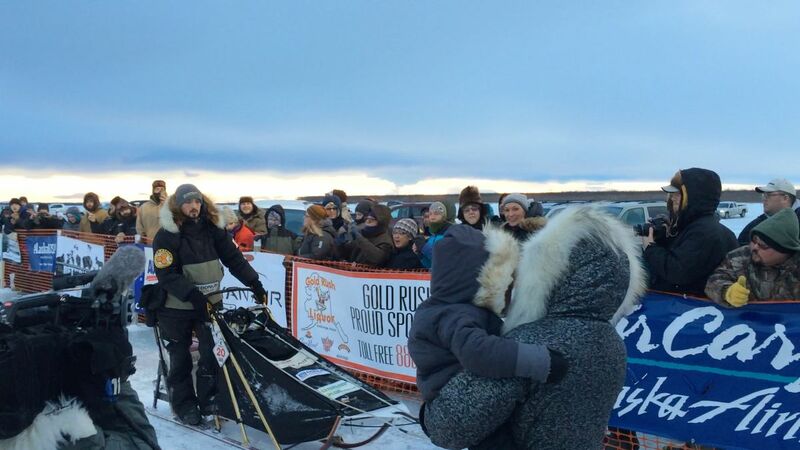 Bethel musher Pete Kaiser will be chasing one for the thumb this weekend — his fifth Kuskokwim 300 championship. Girdwood musher Nic Petit will be among those trying to get in his way. The 40th annual Kusko 300 sled dog race begins at 6:30 p.m. Friday in Bethel, where a field of 19 mushers will depart from a new start line in front of the small boat harbor. Kaiser and Petit both bring winning streaks into the 300-mile race that goes from Bethel to Aniak and back. Kaiser, the Kusko’s hometown favorite known affectionately as Repeat Pete, has won the last four races. Petit, meanwhile, was undefeated in middle-distance races last season — he didn’t enter the Kusko — and is 1-for-1 this season after winning last week’s Copper Basin 300. Another win would make Kaiser a rare thing in distance mushing — a racer with five consecutive championships in a single event. There’s never been one in the Iditarod or the Yukon Quest, and there’s never been one in four decades of the Kusko 300. Kaiser will have to beat a strong field to continue his streak. Nine of last year’s top 13 Iditarod finishers are entered, a lineup led by defending Iditarod champion Joar Leifseth Ulsom and runner-up Petit. The rest of that group includes fifth-place Kaiser, sixth-place Richie Diehl, seventh-place Jessie Holmes, eighth-place Ramey Smyth, ninth-place Travis Beals, 12th-place Aaron Burmeister and 13th-place Matthew Failor. Also running is nine-time Kusko winner and four-time Iditarod winner Jeff King. King, who has twice won three straight Kusko titles, collected his last win in Bethel in 2013. A purse of $160,000 is up for grabs, making the Kusko the second richest sled-dog race in Alaska, trailing only the Iditarod. An additional $90,000 is at stake in the Kusko’s two companion races — the Bogus Creek 150 ($60,000 purse) and the 60-mile Akiak Dash ($30,000).